After losing the second Test at Perth by 146 runs, India took the necessary action of dropping the openers, Murali Vijay and KL Rahul. Hanuma Vihari was asked to open the innings with debutant Mayank Agarwal. Vihari could not post a big score opening the innings but the time that he spent in the middle made things better for the batsmen to follow. At the other end, Mayank Agarwal went onto score a half-century in his debut innings. After the first wicket partnership of 40 with Vihari, the Karnataka batsman added 83 runs for the second wicket with Cheteswara Pujara. The wicket of Agarwal brought the Indian skipper Virat Kohli into the middle. Kohli and Pujara then went onto bat for more than two sessions without losing a wicket thereby adding 170 runs for the third wicket. While Cheteswara Pujara hit his 17th Test century, Virat Kohli missed out on another hundred as he got out for 82. After playing out two wicketless sessions, Virat Kohli tried to up the ante in the second session of Day 2. In his attempt to increase the scoring rate, Virat Kohli holed out one to Finch at third man. Just a few overs after Virat's dismissal, Pujara got bowled as a delivery from Pat Cummins kept very low. The two new batsmen - Ajinkya Rahane and Rohit Sharma - ensured that India was still in control of the game with a 62-run partnership. Rahane was looking solid all throughout his innings but fell victim to a ball which kept low. Rishabh Pant joined Rohit Sharma in the middle after Rahane's dismissal. Australia gave Sharma and Pant reprisals as they were dropped both the batsmen when they were on 15 each. While Nathan Lyon was the victim on both occasions, substitute fielder, Peter Siddle and Pat Cummins were the culprits. Rohit Sharma then went onto score his first overseas fifty since August 2015. Rohit and Rishabh added 76 runs for the sixth wicket before the latter got out for 39 in attempt to add quick runs at the fag end of the day. Ravindra Jadeja who came in next hit the boundary off his first ball and got out two balls later. With Jadeja's wicket, Virat Kohli declared the Indian innings at 443-7. After the declaration, Indian bowlers took a shy at the Australian openers for six overs. Ishant Sharma and Jasprit Bumrah tested Aaron Finch and Marcus Harris but the two Victorians managed to somehow survive the tricky phase of play. With the pitch starting to slightly misbehave, India would love to take a lead in the series before the final Test. An innings of restraint, almost denial. Don't normally use those words to describe a Kohli innings. Cheteshwar Pujara brings up his 100 in 280 deliveries. This is the first time he has taken over 250 balls to bring up a Test hundred. Pujara goes after a magnificent innings but the Aussies will be concerned at the manner of his dismissal. 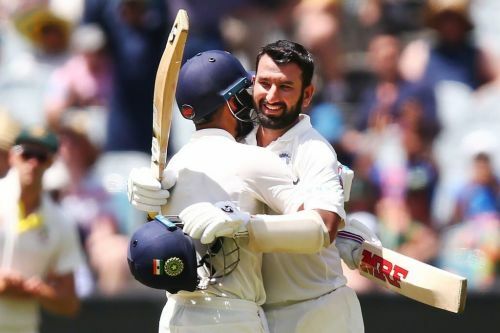 Days like these when all the sacrifice and coaching of his father Arvind and early practices at the the “Railways Parkland” must bring great great satisfaction to Cheteshwar Pujara and his family. 17th Test century. Solid as a rock👏🏻👏🏻👏🏻. "It's always been a toss up for me between the RR & MI, who I support. Rohit's Test career says, Thank you Siddle. I think Rohit Sharma's general aura of talent is blinding the Australian fielders. I cannot believe Australia have Pat Cummins in readiness to come out as nightwatchman. He bowled 34 overs pounding the ball in on a slow deck and was on the field through. If anything, the next batsman should say, you rest I'll bat.